The first day of a new month. for the daily photo community that means theme day. This month we bring you feet. A beautiful shot, Mo. You got pretty close to this duck. Well done. Or you have a good zoom. 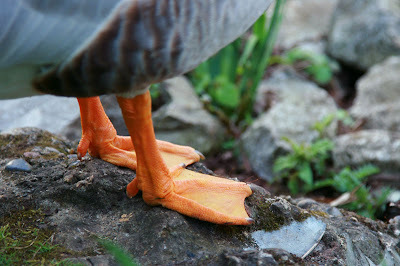 Aren't ducks' feet the most amazing colour? Hi Mo, what a fantastic shot ! Who needs orange shoes when you have the most fantastically orange feet anyway ? Nice colours - the bright green and the orange make a lovely contrast to the grey rocks!! I think this is the first time I've seen duck's legs up close. Cartoons aren't exaggerating the orange color, are they? Cool choice for theme day! My favourite colour and the colour of my Ford Focus ST. Duck feet bring luck feet! British feet meet webbed London feet! Quack feet not on a street to greet! Those feet are a sweet treat! EAGAN daily photo feet greet from my friendly Minnesota, USA street! Great shot! I love it. Lovely feet! You have the most amazing ideas. Ciao. A. Great feet. I like your photos of London. Thank you for visitng Tampa Daily Photo. Please come again and I look forward to seeing more of your London. You're a lucky duck to have found these bright orange feet. Love the photo. I love the color of these feet -- and the detail. Great job. The colour of these feet is lay-down gorgeous, Mo. Some feet are just prehistoric looking aren't they? At last someone else has bird's feet. I thought it was just me. The orange just pops. Ducks are "arranged" in such an interesting way. I love the close-up. I looked at the enlargement and you're completely focused on de feets.